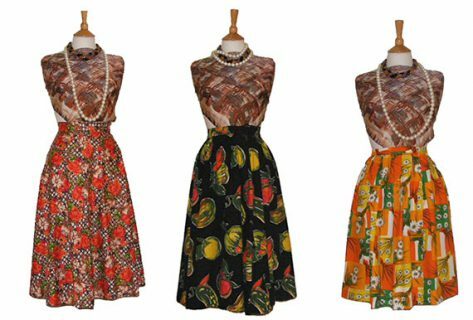 Women’s vintage Skirts have gone through some fascinating changes over the years, long, short, mini, maxi, thigh skimming or floor length, they are an essential part of any woman’s wardrobe, whether you’re wearing then to work or to relax in. Whatever your taste, a skirt from Blue17 will be a good choice, because we put so much hard work and effort into choosing them. We have a wide selection of vintage and retro skirts that cover many decades and they’re all in excellent condition. You can find the skirt you’re looking for by searching by decade, brand or by selecting the women’s category and then searching for skirts on the drop down menu. Then it’s an easy, relaxing time while you find the style you’re looking for. You may not be entirely sure what you want, perhaps you’re looking for a one that’s going to blow your mind and makes you want to have it. We may be biased, as we believe all our skirts will have that kind of impact because we choose all our garments very carefully and check for quality. They come in all patterns, cuts, fabrics and styles, and you may find it hard choosing just one. Choose from high waisted full skirts, full a line skirts, long printed skirts, long midi skirts and many other styles. As all our clothes come at affordable prices, you won’t find that a purchase with Blue17 breaks the bank. We have a pretty mind blowing selection of good quality 1950s skirts and our printed skirts are quite impressive too. So we’d like you to browse with pleasure and enjoy your visit to Blue17 and if you can’t find what you’re looking, or you’re unsure about anything, then either visit us at our store, or send us a message, contact details over on our contact page. Enjoy shopping for Women’s vintage Skirts at Blue17 and enjoy being spoilt for choice.